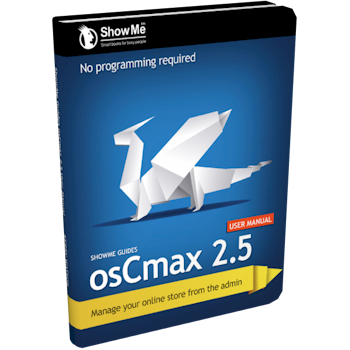 The osCmax v2.5 user manual is the definitive guide if you want to master osCmax quickly. This eBook covers the osCmax v2.5 series, including all 2.5 releases (like 2.5.1, 2.5.2, etc...). NOW WITH FREE Installation Guide, FREE QuickStart Guide and FREE Admin Menu CheatSheets! Just download now and start playing with the program immediately! NO PURCHASE REQUIRED FOR FREE PREVIEW CHAPTERS. SKILL LEVEL: NON-technical users, NO PROGRAMMING REQUIRED. Note: When you complete your paypal payment and return to the store, your download link will be available immediately on the "Order Success" page near the middle. You will see a "Downloads Available" line item with a Download button to the right of it. Click the button and your download will begin immediately. * This ebook will not open on iPads because Apple will not allow Java to be installed on iOS. You can't read this eBook on an iPad or iPhone. Sorry!